My Dad and I found something new we can bond over! Additionally, Daddy’s a several-times survivor of cancer and has difficulty swallowing due to radiation treatments. So he has an easier time with soups and physically cannot handle spicy foods anymore. Whereas I, as far as food is concerned … the bolder the better! I was the kid who loved sweet vidalia onion sandwiches with mayo on white bread. I was the teenager who ate pickled jalapenos straight out of the jar and always used lots of horseradish on her prime rib (that’s right, I didn’t go veg until my 20’s). I was the young woman who always used “wild” not “mild” sauce. And I am now the woman who can eat North Indian food every bit as hot as her Punjabi partner. To my surprise I found that Nancy had been a real afficiendo of Thai food and my Dad is familiar with almost every Thai place in Charlotte, NC! So, my Dad and I have been having a GREAT time checking them all out, together! Today we went to Thai Taste in Dilworth. Atmosphere. The place is absolutely adorable. It looks exactly like you want a Thai restaurant to look. It was a cold, windy day today and it really couldn’t have been any more cozy or inviting. 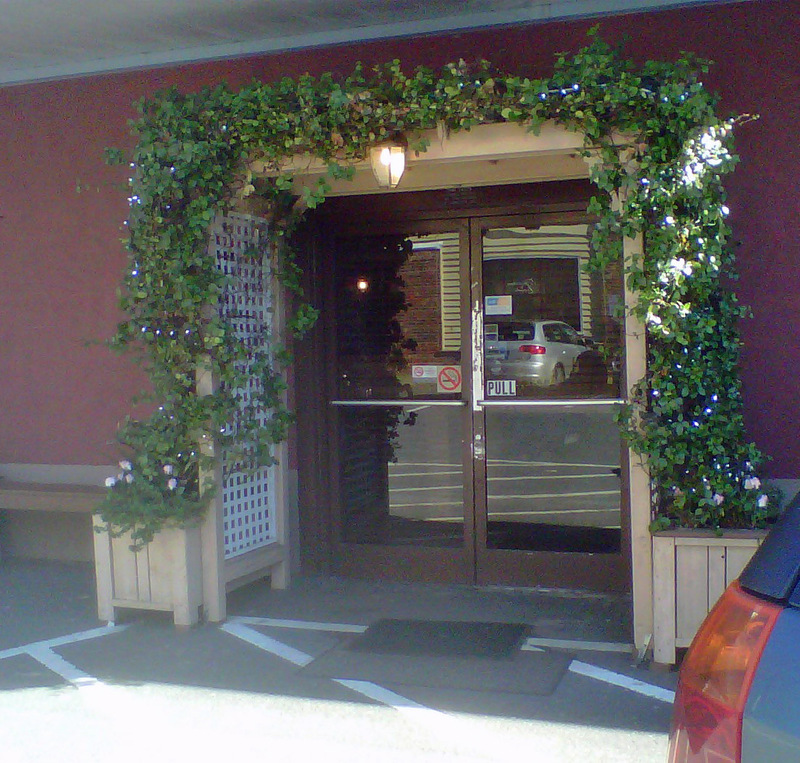 Entrance to Thai Taste. So inviting on a winter’s day! 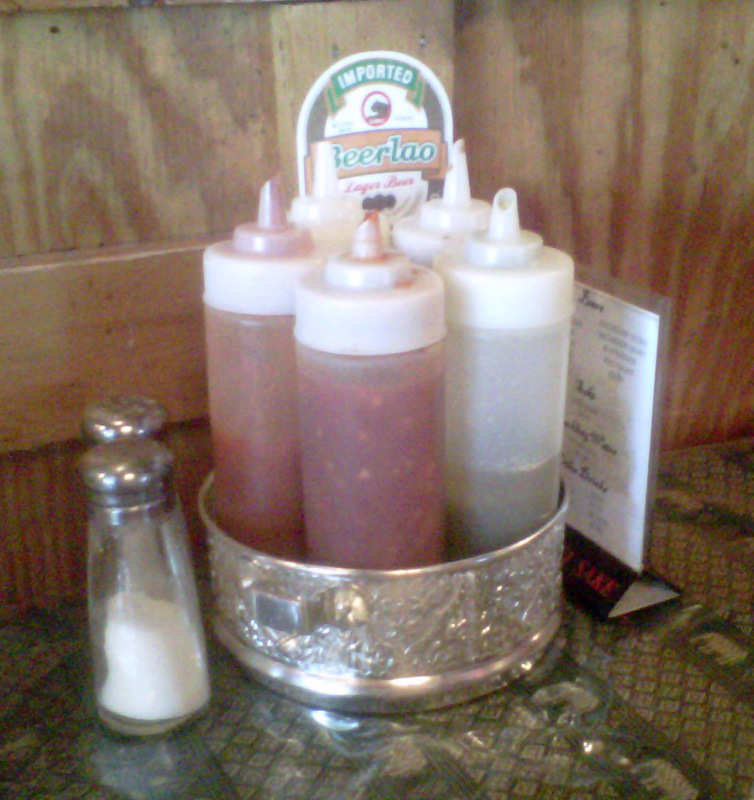 There are CONDIMENT TRAYS on the tables!!! I just love it when I can “adjust” things a little on my own. The staff is super-friendly and knowledgeable. Our waitress was very sweet and willing to advise my dad on which items from the luncheon menu were the least spicy. She was also knowledgeable about whether the soup contained chicken broth or egg. Additionally, the staff was helpful in other ways – we carried our two boxes of leftovers to the cashier to pay, and a passing waitress (not ours) asked if we needed a bag … I headed for the ladies’ restroom, another waitress guessed my intention and gave me directions. Lunch price includes iced tea (two glasses plus a small pitcher left on the table), soup, and spring roll. I couldn’t locate our waitress to query about the spring roll, but pulling it carefully apart it seemed to be mostly cabbage. My dad was VERY pleased with his entree (he even liked the tofu!) and they did indeed have it spiced mild enough to accommodate him. Vegetarian lunches are $8.95 – the same price as a lunch with chicken, beef, or pork! I mean, c’mon! We all know vegetarian lunches should be a dollar less! I had exactly three small squares of tofu in my meal. I’m not a big tofu lover and I certainly don’t worry about getting enough protein, but … a couple more squares would have made the meal feel more substantial. I ordered Pud Prig Khing … (chili sauce, green beans, mushrooms, bell peppers, and basil leaves). 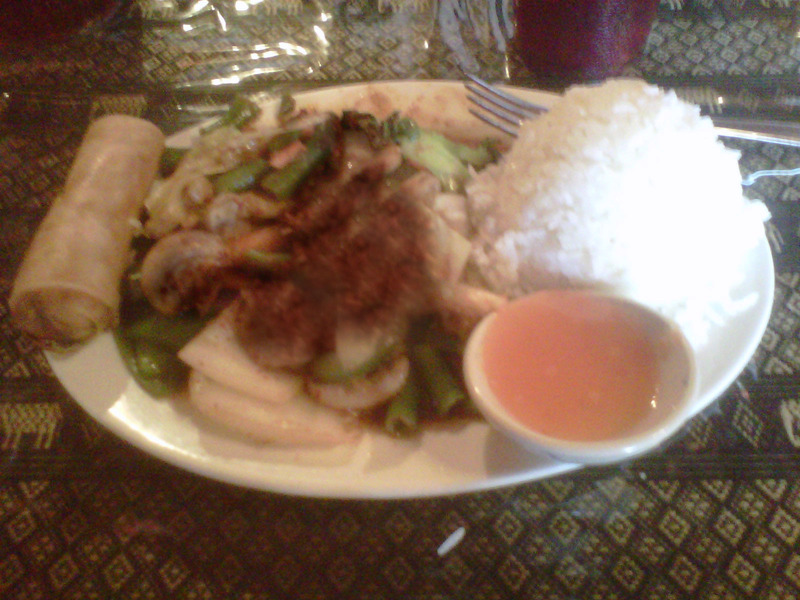 The waitress asked me spice level 1-5; since it was my first time at Thai Taste, I chose 4. She seemed very surprised and impressed. When she brought it to me, I understood why. The stir fry was topped with about 1/4 cup DRY red pepper flakes! Maybe it was my fault and I wasn’t mixing enthusiastically enough. Or maybe there wasn’t enough liquid/sauce in my stir fry. The pepper flakes mostly remained kind of dry, got stuck in the broccoli, and more or less distributed unevenly throughout my food. The result: Some bites were bland (I did taste the sauce before stirring – if there was basil, lime, cilantro, lemongrass, etc. I couldn’t tell!) and some bites were coughingly hot. Or maybe I was just coughing because I was eating dry red pepper flakes! Mmmm hmmm. Most of you are understanding me now. If you add spices to a dish AFTER it’s been cooked, it should be FRESH spices! Fresh cilantro, basil, parsley, dill … whatever. You don’t top with dried spices. If I DO go back to Thai Taste … I will probably order a low spice level and then add spice with the condiments at the table. At least those are liquid, and would blend with the food. 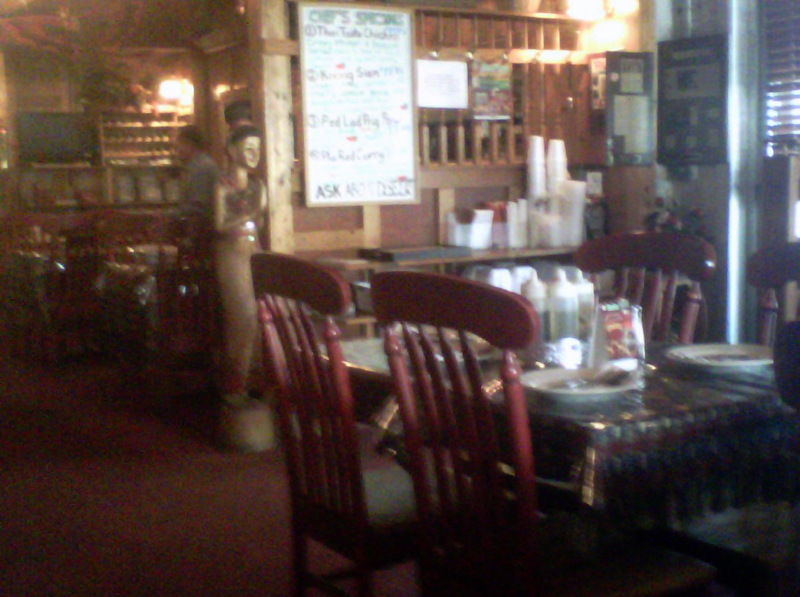 The place is adorable with great service. If you like “Americanized,” mild Thai, it’s for you. Thai Taste Inside. So adorable. If you like your Thai food hot and spicy and complex and layered … it’s probably not for you. « 2013 VegCharlotte Awards – Best Sandwiches! Thanks … this is a GREAT article!!! No, I don’t think he would like Zizi’s any better!!! I do all of my own posts – and I am the person pictured. (Taken in Savannah, GA two years ago.) OK, I’ll come clean – I am Catherine Brown, and you did meet me once at a VegCharlotte meetup at a Mexican restaurant. I don’t think we had the chance to communicate though – you were sitting near my then-assistant organizer Danielle, and I was at the other end of the table. My father IS a minister and he WAS very veggie-unfriendly at first – but has come to accept me for who I am, I guess, even if he doesn’t understand it. I never saw any of your comments concerning my dad – maybe they were marked as spam. Send again, and I will respond. In fact, I approve and respond to all comments except those written by lovers of livermush. But – yes. This page is me. All me. Come to the Circus Protests tomorrow if you have doubts.